This was the first-ever download-only album from Procol Harum. Tracks available through 'Beyond the Pale' were encoded at 320 mbps; this is twice the bitrate of standard iTunes downloads. Artwork and tracklisting etc were not part of the download: take what you need from this page. There was no physical CD of this live set: the download was the only version. Procol Harum is a band that means many things, and even different things, to different people. It’s a band that writes innovative and emotional compositions, recorded beautifully on their studio albums. And it’s a band that performs this music with much power and brilliance in their concerts: a strong and rare combination. One Eye to the Future gives us this: fantastic songs with the added variation and energy only a first–class live band can give. This album was recorded in Italy at the end of Procol’s fortieth anniversary tour. The selected seventeen songs span their whole career, from their début single and its follow–up, Homburg, through nine of their eleven studio albums and on into One Eye on the Future, an unrecorded song only heard live in concerts. 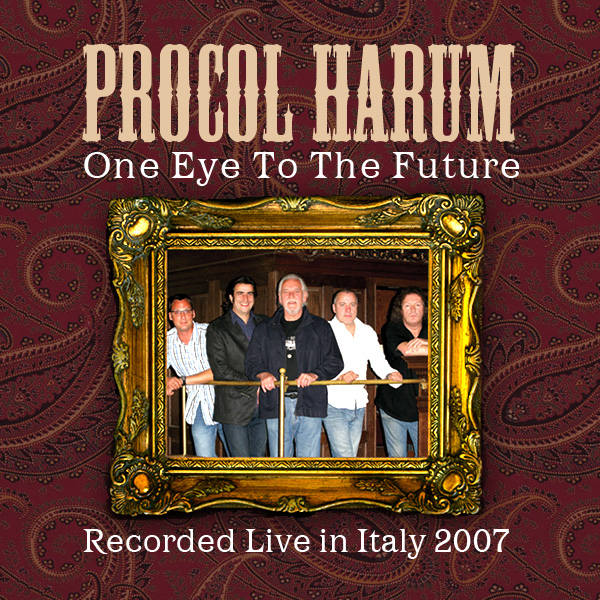 One Eye to the Future is not only an excellent live compilation of some of the band’s best music. It is also the first recording of the current line–up of musicians and, as with every version of the band, each player brings new life to the music, although it still has the perfect Procol Harum signature all over it. As such this album makes a good choice for both the occasional listener looking for a ‘best of’ compilation from the band, and also for the hard–core fan who will pore over the fine details and musical variants added by each musician. Procol Harum have always been a superb live act, and One Eye to the Future sees the band in top form. Add this to a great selection of songs, and you may well be holding their best live recording on offer. This also marks Procol Harum’s first release of a ‘download only’ album, an indication that the band may well keep one eye on the past, but they are also looking excitingly to the future. The tracklisting (including two hitherto-unrecorded songs) will delight the committed fan and offer a great 'best-of' taster for the non-specialist listener: whoever you are, you'll be hearing a world-class rock band at the top of its game. Most Procol fans downloaded the entire album, of course. For those who chose to download only particular tracks, the proportions (at the end of March) were: Grand Hotel, 1.25%; Conquistador, 2.5%; Whisky Train, 2.5%; A Salty Dog, 3.75%; The VIP Room, 5%; Learn to Fly, 5%; An Old English Dream, 5%; A Whiter Shade of Pale, 5%; Shine on Brightly, 6.25%; Pandora's Box, 6.25%; (You Can't) Turn Back the Page, 6.25%; Simple Sister, 7.5%; Worried Life Blues, 7.5%; Bringing Home the Bacon, 8.75%; Homburg, 8.75%; A Rum Tale, 8.75%; One Eye on the Future, 10%.